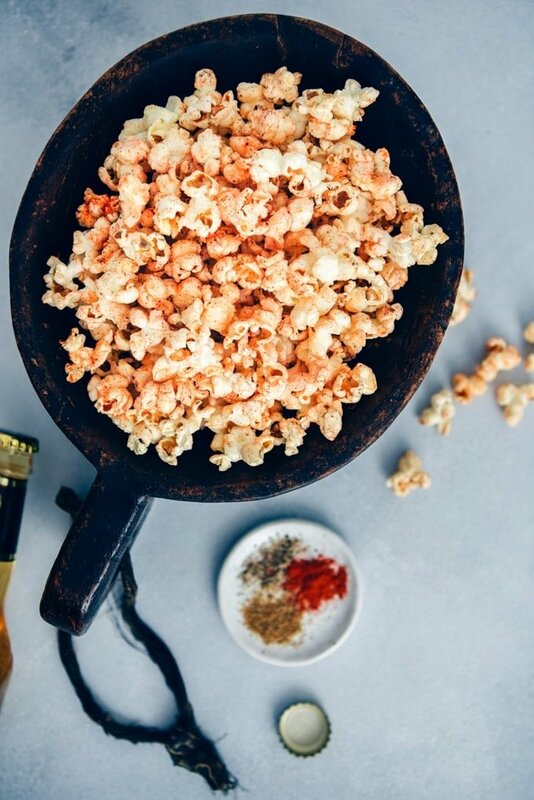 Salty Spicy Popcorn is the best game day snack. Seasoned with chili, cumin and black pepper. You won’t want to buy spicy and crunchy chips from store while you can easily make it at home on the stove. Super quick and easy to make! Way cheaper too! Our all time favorite spicy snack to pair with cold beer is Spicy Crispy Roasted Chickpeas but it takes a bit of time. So when we want to be quicker, we always go with this spicy popcorn, trying different additions each time. This one tastes like those addictive store bought chips, so it is a winner for sure! 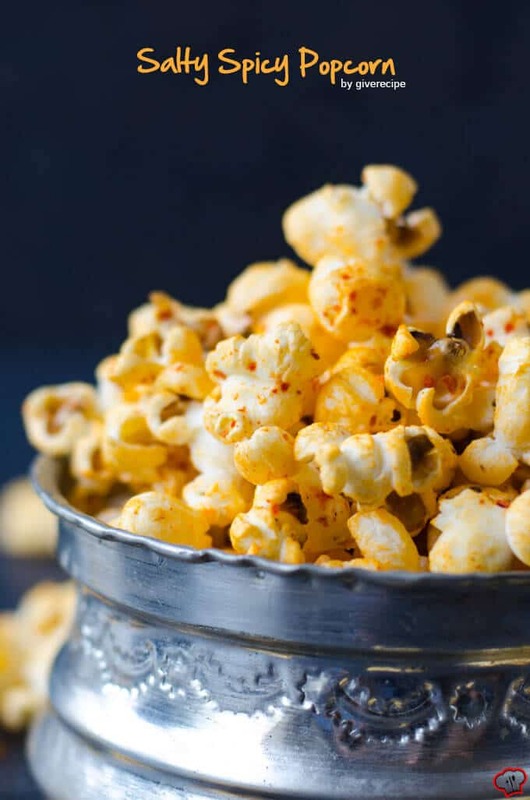 This salty spicy popcorn is one of the ultimate crowd-pleasing snacks you have to try. Making popcorn is not rocket science, but if you’ve never tried it yourself, you might end up with some burned corn kernels. So if you don’t have a device for it, you should do things right to have well popped corns. There are various methods of making stovetop popcorn and I’d love to share mine here. We only need four things to make popcorn from scratch: A pot with a lid, popcorn kernels, oil and salt. Sounds simple, right? First, pick a heavy-bottomed pot so that the heat spreads evenly. Plus, don’t forget the lid! You will mess it up otherwise. Second, add oil, corn kernels and salt in the pot, all at the same time. Give them a good stir so that all the kernels are coated. Make sure you don’t overload the pot with corn kernels though. Put them in a single layer. You can pop the corn kernels in batches repeating the same steps if you need a lot more popcorn. Third, cover the pot with its lid and put it on the stove over medium high heat. Wait until you hear popping sounds. It takes a minute or so. When you start to hear popping sounds, remove the pan from heat and gently shake back and forth. This will give all the kernels enough room to pop. Make sure you wear oven gloves or use pot-holders when doing this because the pot is really hot. Next, put the pot back on the heat and keep the lid slightly ajar so that the popcorn doesn’t steam. You will see the corn kernels continue popping for less than a minute. Finally, remove the pot from the heat when you hear rare sounds of popping, but don’t remove the lid. Keep it ajar. Wait for about a minute until you hear no sounds. That’s it! Serve it in popcorn bowls. 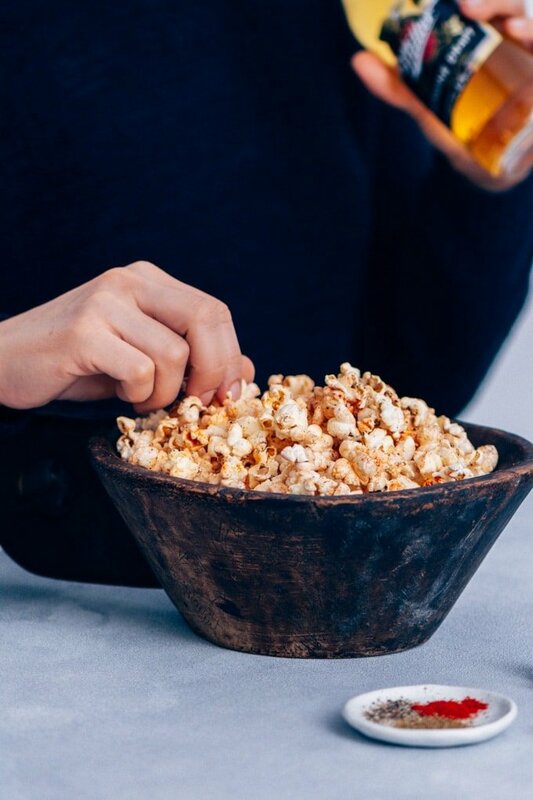 We love snacking on popcorn especially at our movie nights or on game days and love to create new recipes with it. This Salty Spicy Popcorn came out of Yusuf’s love of chili. You can add as many spices or toppings as you like to create your favorite popcorn. 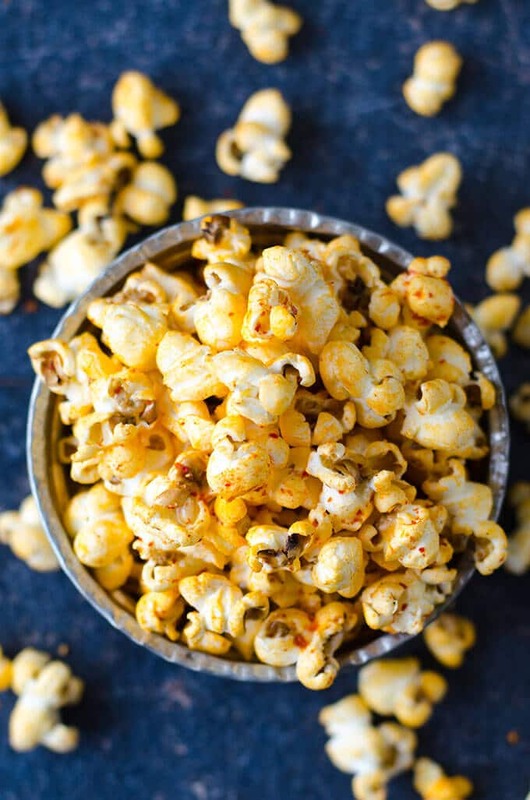 This one is spiced with chili powder, black pepper and cumin, so this salty spicy popcorn tastes like spicy chips. You can make all seasoning when you put the corn kernels along with the salt in the pot as mentioned above. Put the oil, kernels, spices in the pot at the same time and stir well. When all the kernels finish popping, drizzle oil over them, sprinkle the spices and stir well. Well, I used to apply the second method to make spicy popcorn but one night, I tried the first method, seasoning them before they pop and saw that it was even better. The spices stick to all the popcorn much better. They become naturally colored popcorn. As for the salt, I hate when my popcorn doesn’t have enough salt. That’s why I call this one salty. Salt is a must when making popcorn. At least for me. You can adjust the amount of salt to your taste. 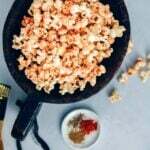 This is a basic seasoning to make spicy popcorn, but you can easily create many other options. Get even more ideas from Sarah’s Easy Homemade Popcorn Seasoning post on her lovely blog. This salty spicy popcorn makes a wonderful Super Bowl snack. So make a change on your regular Super Bowl treats and try this super easy popcorn. It goes perfect with cold beer, so make sure you have enough of these. Just sayin’. If you are planning to have your friends for dinner on the game day, you can definitely please them with Simple Roasted Chicken Pieces, which is not the quickest but the easiest chicken recipe. Then you can continue the night with this Salty Spicy Popcorn. Oh and if you are after a sweet popcorn recipe, you have to check out our Sprinkles Chocolate Popcorn! If you have an instant pot and want to make your popcorn using it, check out Lisa’s method Instant Pot Popcorn. Homemade stovetop popcorn seasoned with chili powder and cumin. Put 1 tablespoon olive oil, kernels and salt into a large pan. Make sure the kernels are in a single layer. Cover the pot and heat it over medium high heat. Wait about 30 seconds until you hear popping sounds. Take it from heat and shake the pan moving it back and forth. Put it back on the heat with its lid slightly ajar. Repeat this two or three times in a minute. When the popping slows down, remove the pot from the heat and wait until you hear no sound, about a minute. Make sure the pot is still ajar. When there is no popping at all, remove the lid. Drizzle 1 tablespoon olive oil over it, sprinkle cumin and chili powder and stir with a spoon well until all kernels are coated. Note: As an alternative seasoning method, you can sprinkle all the spices on the corn kernels when you put them in the pot along with the oil. Give them a good stir with a spoon and then pop. This post was published in 2015 and has been updated with new pictures and additional information. Last night I almost bought some spicy chips. Then I remembered I had some popcorn at home. I found and followed this recipe and was not disappointed. It was kind of addicting. The only change I made was I added some cayenne also, to kick up the spicinesss. The chips at the store cost $3.79. This recipe cost maybe 35 or 40 cents, if that. Hi Timmi! I’m so glad to hear that you found the recipe right before you were about to buy some chips. Adding cayenne is a great idea! Need to try it next time. I assume you also add salt?